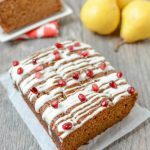 This recipe for Pear Gingerbread is perfectly spiced and full of flavor. It’s easy to mix up in a blender and is great for an afternoon snack or topped with some ice cream for a holiday dessert. Combine all ingredients except flour in a blender and puree until smooth. Add flour to blender and process until just combined. Pour into greased loaf pan at bake at 350 degrees for 45-50 minutes. Drizzle with glaze and top with pomegranate just before serving if desired. If you don’t have a blender you could use a food processor. Or, just puree pears and mix everything in a mixing bowl. Or simple mash pears well by hand.